MYAGDI, Sept 20: Jhak Bahadur Chhatyal of Gurja village in Myagdi district has the ownership certificate of his house but not the land which he has been using since years. Despite being the chief of ward no 1 of Dhaulagiri Rural Municipality, Chhatyal has not been able to transfer the ownership of the land in his name from his father, who died ten years ago. None of the locals of Gurja have a single piece of land in their names, according to Chhatyal. It has been a long time since they have been growing crops and vegetables in small fields but have not been able to own them. It has been more than four decades that these people are making rounds of the Department of Survey for land ownership certificate but to no avail. According to ward chief Chhatyal, locals have not been able to solve their problems despite having land and property in lack of ownership certificate. Earlier, people used to buy and sell land based on verbal statement without any document. That is posing serious problems for the locals now. Confusion over the land demarcation often results into disputes among the locals. During various phases of elections, the poll candidates had assured to solve the issue of land ownership but none of them showed their concern after being elected. "The state has treated us no less than squatters in lack of land ownership certificate," said ward member and woman leader Sita Chhatyal, adding, "We have repeatedly urged the survey officials and the Land Revenue Office for an on-site visit but our pleas have fallen in deaf ears." In lack of written papers, the locals have not been able to seek loans for starting business. It takes two days on foot to reach Gurja from the district headquarters Beni. According to locals, it would be no less than winning a war if they could get land ownership certificate. Locals are unable to sell or transfer the ownership of their land in lack of land certificate. On Tuesday, Chief District Officer (CDO) Liladhar Adhikari had visited Gurja, where the people urged him to address their issues. CDO Adhikari assured that he will visit Gurja along with the officials of the survey department and Land Revenue Office during a mobile camp which will be conducted in November. 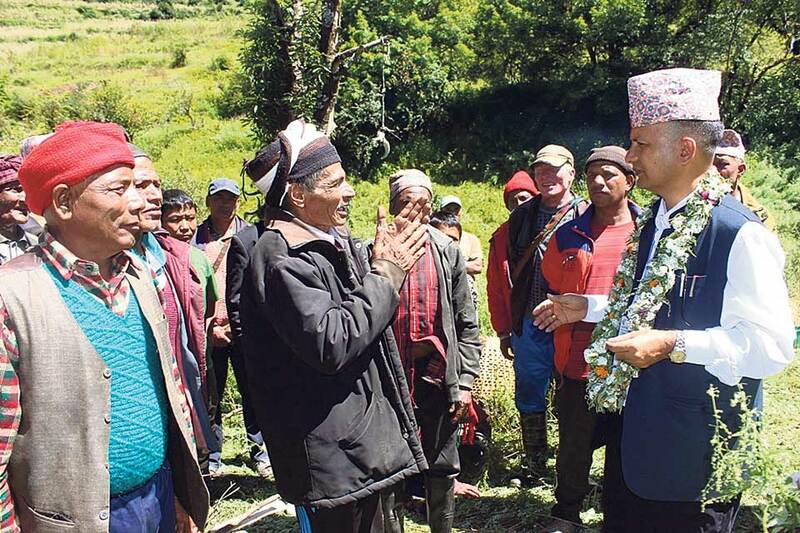 "I am well aware about their problems and will do my best to solve them," said CDO Adhikari. He also assured to distribute land ownership certificate in the camp if the person has enough legal proofs. Locals here have to walk for a day to reach road. In case of serious illness, villagers hire helicopter and reach Pokhara for treatment.